With the installation procedure just taking 30 seconds, you can save 35 � on each round fired. Just think, you will pay for your conversion kit after firing just two bricks of .22LR ammo. Our 2011 Target Conversion Kit is our most accurate conversion kit. The barrel is fixed solid to the frame with the sights mounted to the barrel. Accuracy is not affected by the movement of the slide. Our 2011 Standard and Commander Models more closely resembles your 2011 where the sights are mounted to, and move with, the slide. Both the Standard and Target models use Champion adjustable sights. The slide will lock open after the last round in the magazine has been fired. Our unique magazine design and patented heat-treated steel lock open insert allows us to offer this special and desirable feature which you can only find on 'Advantage Arms' .22LR conversion kits. All Aluminum parts are Anodized Per Mil-A-8625 with a matte black finish. All steel parts are heat treated with a Black Oxide Finish. The barrel is made from heat treated 4140 steel. Installation is simple and does not require any modifications to your 2011 pistol. Simply remove the 2011 magazine and slide as outlined in your 2011 owner's manual. Now slide the "Advantage Arms" slide onto the frame, insert the slide stop pin and tighten guide rod. Insert the conversion magazine. You are now ready to shoot. This procedure can be accomplished in less than 30 seconds with some practice. 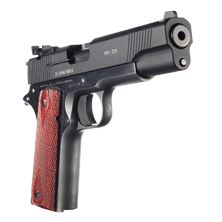 Our 1911 .22LR Conversion kit is designed to fit any full size 1911-A1 frame made to U.S. government mil-specs. We highly recommend Remington "Golden Bullets" for everyday plinking and CCI MiniMags or Federal Automatch for better accuracy.